Neil Armstrong immediately after his, and mankind’s, very first moon walk, 1969. On July 20, 1969, Neil Armstrong became the first man to ever walk on the moon, starting a new era on the space exploration. We’re often subjected to the standard shots taken by Buzz Aldrin of the grey, rocky surface with a few faceless spacemen standing still and posing. That’s why this photo, rarely seen, is such an impeccable piece of history. The look of pure joy, accomplishment and disbelief is just a testament to what the mankind can achieve. 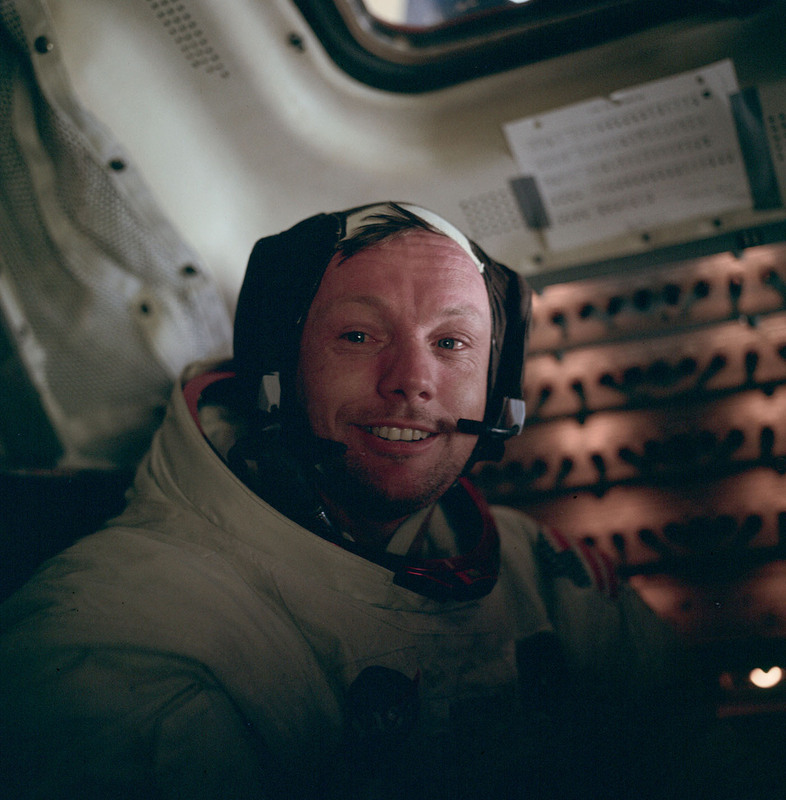 Aldrin snapped this shot of a teary-eyed Armstrong moments after he returned to the spacecraft and removed his helmet. His ecstasy is palpable; it is the face of a man so clearly awe-struck that all he can do is grin and cry. Armstrong would later describe his emotional state as “elated, ecstatic and extremely surprised that we were successful” – and we see it all, right here. “It suddenly struck me that, that tiny pea, pretty and blue, was the Earth. I put up my thumb and shut one eye, and my thumb blotted out the planet Earth. I didn’t feel like a giant. I felt very, very small”. At 2:56 UTC July 21, 1969, Armstrong set the first human foot on another world. With more than half a billion people watching on television, he climbed down the ladder and proclaimed: “That’s one small step for a man, one giant leap for mankind”. Aldrin joins him shortly, and offers a simple but powerful description of the lunar surface: “magnificent desolation”. After helping to set up the Early Apollo Scientific Experiment Package, Armstrong went for a walk to what is now known as East Crater, 65 yards (59 m) east of the LM (Lunar Module), the greatest distance traveled from the LM on the mission. Buzz took this picture of Neil in the cabin after the completion of the EVA. Neil has his helmet off but has not yet doffed his “Snoopy” cap. The circuit breaker panels are illuminated, and a small floodlight is on at the lower right. A circuit breaker chart has been fixed up on the wall with gray tape, below the rendezvous window in the cabin roof. (Photo credit: Apollo 11 Image Library). he never stepped on Moon, was everything a farse. Yes he is, move on with your life Charles lol. The look on his face summed up all of mankind's achievements up to that very point in time. I don't think we've really accomplished anything greater since then. That was the pinnacle. The face of an disciplined military man forced to become little more than the starring actor in a real life science fiction epic called the Apollo project...He was forced into playing the role against his will and though sworn to the utmost secrecy, he wanted to let the fact it was all a hoax out of the bag without letting his play writers at NASA know. This was patently obvious during the post Apollo 11 press conference, when he and Collins flat out lied about not being able to see stars, either in lunar orbit or on the lunar surface "without using the optics". With that statement, what he was actually admitting is that the reason he and Collins could not see stars was they never actually went to the Moon! The furthest they traveled was to the comparative safety of low Earth orbit, where he and other two Actornauts spent the duration of the mission, until being ordered to initiate re-entry procedures and return home. Meanwhile, the pre-recorded EVA video footage, shot in studios here on Earth, were played back to the press in low resolution, so as to try and hide the illusion. To the untrained eye, the subsequently released high-res still Hasselblad shots seemed to confirm everything they had been told...To the trained eye however, they are irrefutable evidence of fakery...Obviously shot in studios with the use of more than one light source, a simple matt black backdrop and with the use of both front and back screen projection.